Manny joined HHL Architects in 2007 and became a registered architect in 2010. He holds a Master of Architecture from the University at Buffalo, where he also completed his undergraduate work in the same field. He went on to teach at the University in the School of Architecture and Planning, and is also currently an Associate Adjunct Professor at Erie Community College in the Construction Management Technology Department. 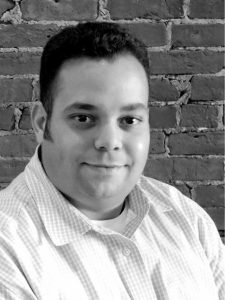 Manny has been on various community boards, including the Massachusetts Avenue Project, Heart of the City Neighborhoods, at which he is Board President, and as a board member for the Buffalo/Western New York Chapter of the American Institute of Architects. Manny has served as a mentor to students on the JCSB Project through ACE Mentoring, on the Steering Committee for the Career and Technical Education Department with the City of Buffalo Public Schools, as well as with Erie Community College students. Manny’s innovative designs and technical mastery are displayed in numerous projects at HHL Architects, such as the Lafayette High School Renovations, The Delaware North Building, and on many multi-family housing projects across the country.